The Department of Materials Science & Engineering and the Analytical Instrumentation Facility (AIF) are proud to announce the installation of a new FEI Titan G2 aberration corrected scanning transmission electron microscope (AC-STEM). As “nano” becomes an ever-present prefix of daily life, demand has increased for analytical capabilities that reach beyond the nanoscale. 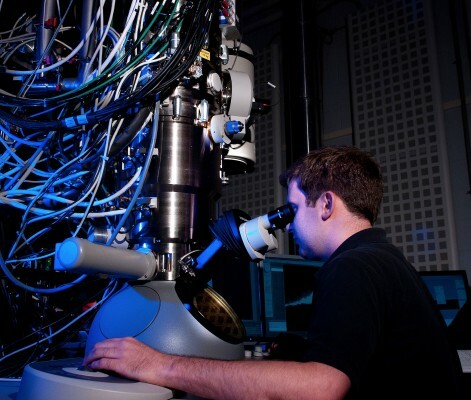 Scanning transmission electron microscopy has served as one of the most powerful nanoscale characterization tools available to the materials scientist. These instruments use a series of magnetic lenses to focus electrons into a vanishingly small probe, which is then scanned over an extremely thin (10-100 nm) section of material. The sample atoms then scatter the electrons to an imaging detector. An example conventional STEM image is shown in figure 1a, showing a single crystal of Si imaged down the <110> direction where the bright locations correspond to individual columns of atoms. Unfortunately, inherent aberrations of magnetic lenses distort the trajectories of the electrons and have limited the spatial resolution of conventional STEM instruments to about 1 Angstrom. Within the past decade, however, electron microscopy has been reinvigorated by the advent of the aberration corrector. This device adds a series of magnetic lenses to alter the electron trajectories back to their near ideal paths, providing a focused spot below ångström in size. The addition of aberration correction dramatically improves image resolution, unlocking information about material defects that was beyond the reach of prior generation instruments. The FEI Titan G2 at NCSU has reached imaging resolutions of better than 0.78 Å, and the difference is apparent in the image of Silicon in figure 1b. This instrument can operate at between 80 and 300 kV, extending angstrom scale imaging to even beam sensitive materials such as graphene. Further, the instrument is equipped with a cadre of imaging detectors, a state of the art advanced energy dispersive X-ray spectrometer, and a monochromator for vastly improved electron energy loss spectroscopy. Atoms emit characteristic X-rays when irradiated with a high-energy electron beam. Collection of these X-rays, called energy dispersive X-ray spectroscopy (EDS) provides detection and quantification of the elements present in a sample. When the aberration corrector is combined with FEI Chemistem® technology, atomic resolution chemical imaging becomes possible as shown in figure 2a. The detector consists of four X-ray detectors positioned around the sample and is equipped on the NCSU Titan. The large detector also enables analysis of samples that would not normally provide adequate signal, such as the Au/Pd core shell nanoparticle in figure 2b. High resolution EDS can be utilized to analyze the segregation at grain boundaries or interfaces, and may also be used to quantify chemistry of semiconductor devices on the micro scale in a matter of minutes. In addition to generated x-rays, the electrons that pass through the sample can become imprinted with information about the chemical and electronic structure. While passing through the sample, electrons from the probe often eject an electron from the atoms in the sample material. During the event, an amount of energy is lost from the probe electron that depends on the specific atom type and its local bonding environment. The probe electrons can then be dispersed with a magnetic prism, in much the same way as light through a glass prism, and used to form an energy loss spectrum. This technique, called electron energy loss spectroscopy (EELS), usually has an energy resolution of around 1.5 electron volt, or 1 eV. To overcome this barrier, the NCSU Titan is also equipped with a monochromator that reduces the energy resolution to approximately 0.15 eV. This order-of-magnitude improvement enables new possibilities to probe materials, from exploring the details of electronic structure at interfaces to band gap measurements of nanometer scale features. Finally, expertise in electron microscopy at NCSU within the past two years has been been significantly strengthened by the hires of Professor Elizabeth Dickey and Assistant Professor James LeBeau in the Department of Materials Science & Engineering. These new faculty members have brought a tremendous skillset necessary to take full advantage of these new microscope capabilities. Further, facility manager Dr. Yi Liu and postdoctoral scholar Ryan White are integral members of the team to make the Titan successful to users from NCSU, the research triangle, and around the world. The new tool joins a suite of other materials characterization tools in AIF, distributed throughout Engineering Building I and the Monteith Research Center on NCSU’s Centennial Campus. Training is available for interested users with TEM experience, and for-fee service & analysis are available. Interested parties should contact James LeBeau at jmlebeau@ncsu.edu for information.